Introducing a new generation electrolyte analyzer that combines the revolutionary microelectronics of the consumer world with new microsensor technology for a simpler, smaller, faster, and less expensive analyzer. 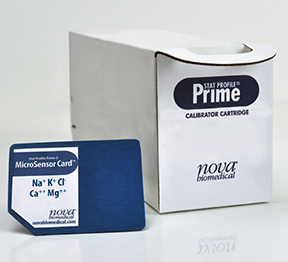 Nova’s unique cartridge system consists of a maintenance-free MicroSensor Card™ that contains all sensors in a miniaturized sensor card format, and a ready-to-use, snap-in calibrator cartridge that contains all reagents. The MicroSensor Card is automatically calibrated throughout its 32-day use life and is always ready to deliver an electrolyte profile in just one minute. Individual cartridges offer a significant benefit in analyzer uptime compared to combined sensor/calibrator cartridge systems. 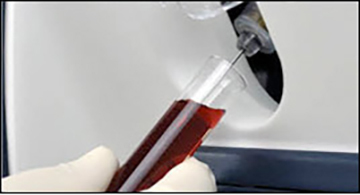 Biohazardous waste is self-contained within the calibrator cartridge, eliminating waste disposal maintenance and potential exposure. In the United States, federal government regulations (CLIA) are phasing out electronic equivalent quality control (EQC) and are requiring true, liquid-based quality control QC. 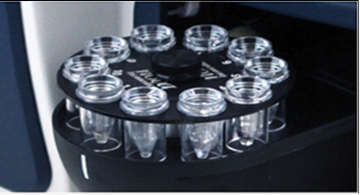 Stat Profile Prime combines both true liquid QC and continuous electronic self-monitoring to ensure lab accuracy and uncompromised quality. Stat Profile Prime provides an onscreen reminder of your customized QC schedule. 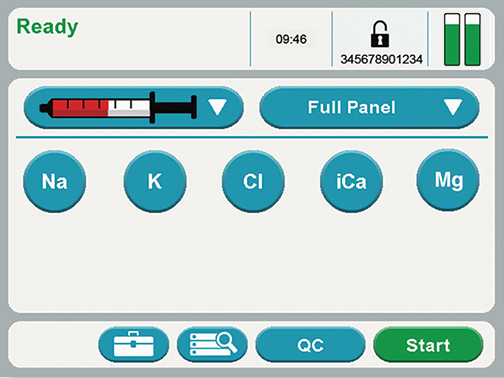 Out-of-range QC results are automatically flagged and an optional QC lockout feature prevents reporting of patient results when QC is out of range. 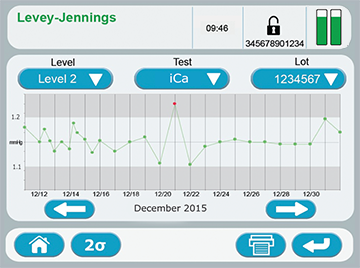 Levey-Jennings charts along with cumulative mean and CVs are automatically calculated for each analyte and displayed on screen. 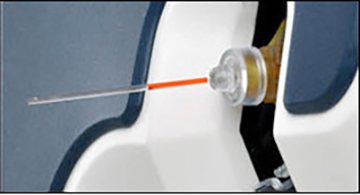 A unique safety sample port protects the user from accidental contact with the sample probe and is easily accessed for all sample containers. eliminating sample transfer to a syringe or capillary. plasma, urine, and dialysate samples. Stat Profile Prime’s 12-in footprint occupies minimal bench space. 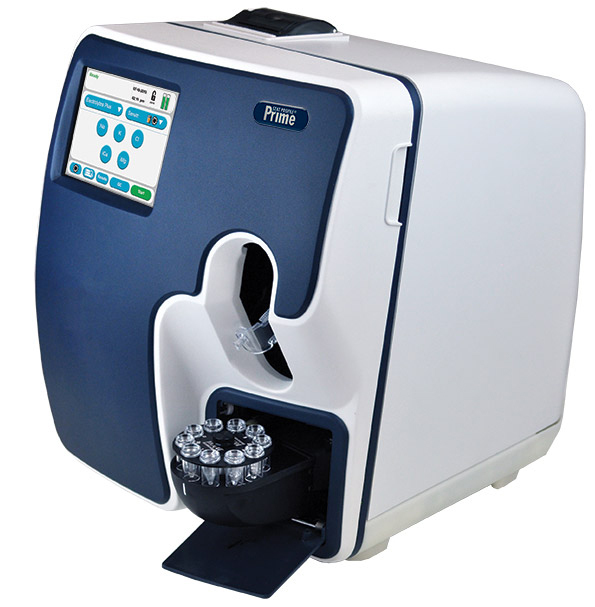 It is so compact it can also be located on a mobile cart for testing in many locations. Patient and QC results can be printed automatically or on demand. The printout also displays normal ranges for each test and flags results that exceed normal range. 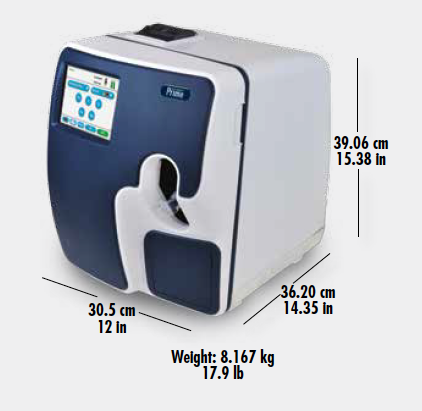 Stat Profile Prime easily connects to laboratory information systems and hospital information systems via industry standard, unidirectional POCT1-A2 communication format or ASTM format. The touchscreen is easily operated through the use of simple and intuitive prompts and requires minimal training. Whole blood, serum, or plasma stats are available in just one minute. 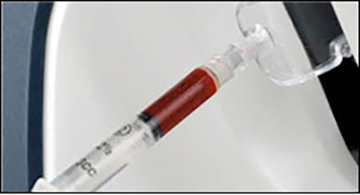 Whole blood stats can be aspirated directly from syringes, capillaries, or tubes, saving time and sample transfer steps. 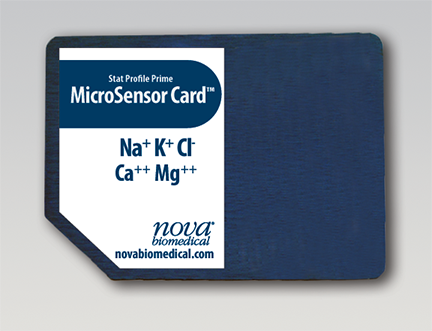 All Stat Profile Prime tests use proven Nova technology in miniaturized, sensor card format. Sodium, potassium, ionized calcium, ionized magnesium, and chloride are all required to maintain normal cardiac function. Disruptions in the balance of any of these electrolytes can cause cardiac arrhythmias, reduced cardiac contraction, and complete cardiac arrest. Stat Profile Prime is the only electrolyte system to provide a full assessment of electrolyte balance.